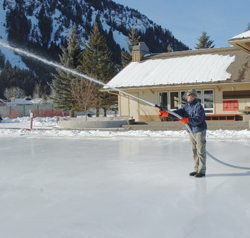 Recreation Supervisor John Kearney sprays a fresh sheet of water Tuesday on the public ice rink at Atkinson Park in Ketchum. The park staff is shooting for a Monday, Dec. 17, opening. The rink, hockey sticks, helmets and skates can all be used free of charge. The rink and gear rental will be open from sunrise to sundown, seven days per week. The adjacent recreation center will be open from noon to 5 p.m. through Jan. 6, 2008. After that, the indoor recreation facility will be open from 2:30 p.m. to 5 p.m., Monday through Friday and noon to 5 p.m. Saturday and Sunday. Valley native named ?Firefighter of the Year?